Long may it wave ... but can't it wave sometime in Pullman? Sat., Sept. 26, 2015, 7:59 a.m.
Long may it wave … but can’t it wave sometime in Pullman? A GRIP ON SPORTS • It’s a college football Saturday and, thanks to something called “UPS express critical,” all’s right with the world. Read on. • I don’t know if ESPN and UPS have a symbiotic relationship, but the delivery service sure got its money’s worth yesterday. 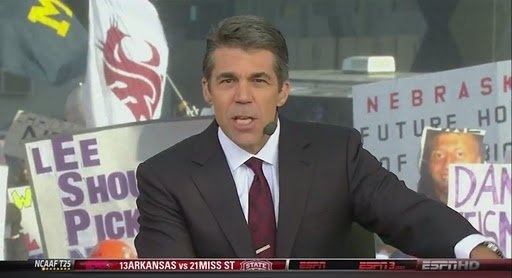 When the Cougar flag somehow got stuck in Mississippi yesterday – didn’t Neil Young or Patsy Cline sing about that once? – the worldwide leader and the guys in brown combined to get a replacement to Tucson in time. But really, why all the fuss about logistics? I’m sure some minor WSU functionary, say athletic director Bill Moos, could have hopped on a Southwest plane in Spokane yesterday afternoon, a new flag tucked safely in his carry-on, and made it to Tucson in plenty of time for today’s show. Oh, right. Moos would never fly Southwest. It’s Alaska Air or nothing. • No Cougar game today, so that means no trip to Pullman and no game-following call-in show. In other words, I have a semi-free Saturday. So you folks are on your own as well. I’m doing links and turning on the TV. It’s a day of college football and/or dinner and a movie. Whatever the boss wants. • WSU: Jacob Thorpe is right on time with his links-filled morning post today today, so we can skim through the Pac-12. I will pass along ESPN.com’s weekly mailbag to keep our game-day tradition going. • EWU: The Eagles are in Sacramento for their Big Sky opener against Sacramento State. Jim Allen has an advance and a morning post with Big Sky links. ... We can also pass along an advance from the Sacramento Bee. ... Montana wide receiver, and former WSU baseball player, Ben Roberts is finding his stride back in his hometown. ... Montana State tries to get back on track against Cal Poly. • Idaho: The Vandals have placed a basketball assistant coach on leave for actions that occurred while he was at the University of Pacific. Sean Kramer has the story. • Chiefs: Spokane opens the WHL season tonight in the Arena. But, as Chris Derrick’s advance explains, it’s a long time until the Chiefs play back in Spokane again. • Shock: New coach Adam Shackleford (or is that old coach?) is bringing along his defensive coordinator from his last stop. • Preps: Friday night lights at Albi last night shone on two different types of games. First up was Mead and Rogers with the Panthers winning a high-scoring shootout 51-21. Greg Lee has that game covered. Then Ferris and Lewis and Clark got together for their rivalry game. The final: 3-0 Ferris as the Saxons’ first points of the season were enough to defeat the Tigers. Dan Pelle has photographs from both Albi games. ... Lake City couldn’t get past Tumwater at home. ... Post Falls routed winless Lakeland 62-7 as coach Jeff Hinz was able to see it. Jim Meehan has the story. ... Tom Clouse was in Cheney for Northwest Christian’s 41-14 win over Colfax. ... We also have a roundup of the other football games in the area. ... The Saxons also won a soccer match yesterday. That leads our roundup of other sports from Friday. • Seahawks: So someone finally asked Jimmy Graham point blank about his feelings. He’s ticked all right. No, not about how the Hawks are using him but about their record. ... Kam Chancellor is on track to play Sunday but Marshawn Lynch may not, thanks to a leg problem. ... K.J. Wright was fined $10,000 after being ejected in Green Bay but he’s appealing. And if that doesn’t work? Next stop: federal court. Wait, he’s not Tom Brady. ... Earl Thomas is all about leadership. • Mariners: The Angels are in the postseason chase, as usual, this season. The M’s aren’t. Maybe that explains the 8-4 Angel win last night. Or maybe it can be as simple as lousy starting pitching. ... The M’s seem to be getting closer to a new GM. ... Speaking of starting pitching, the M’s are a bit thin right now. • Sounders: When has there ever been “unsuccessful” knee surgery? Or at least it was labeled as such the next day? ... The Sounders would love to win their division, of course, but right now they have set their sights a bit lower.